Phone Number of Parker Bows is 540.337.5426 . Red Hot Carbon Arrows, Red Hot Rope Cocker, Red Hot Crossbow Case, Red Hot Folding Forearm, Red Hot Hunting Arrows, etc. 3. Black Lighting Compound Bows. 4. Black Eagle Compound Bows. 5. Ultra elite Compound Bows. 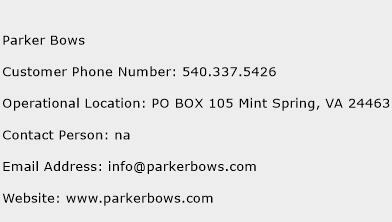 The address of Parker Bows is PO BOX 105 Mint Spring, VA 24463. The email address of Parker Bows is info@parkerbows.com. The Website of Parker Bows is www.parkerbows.com. The contact person of Parker Bows is na. The customer support phone number of Parker Bows is 540.337.5426 (Click phone number to call). The postal and official address, email address and phone number (helpline) of Parker Bows Service Center and Parker Bows customer service phone number is given below. The helpline of Parker Bows customer service phone number may or may not be toll free. No complaints and reviews so far for Parker Bows.To add review or complaint against Parker Bows Click Here. We advise you to express your problem or complaint against Parker Bows. your phone number should be mentioned in your comment, so that Parker Bows will communicate to you on your phone number mentioned in your comment.